Social media is a powerful tactic, to promote your brand and get it in front of different types of targeted channels quickly. According to research recently reported in SocialMediaToday, the average person will spend five years of their life on social media. That’s more time than they’ll devote to eating, socializing and grooming. From an ROI perspective, social media is a cost-effective way to stay top-of-mind, soften the buy cycle through improved reputation, as well as build and nurture new and existing relationships. Social media also is a quick and easy way to test larger marketing ideas and see if it resonates with your audience. Helping to reinforce your message and increase trust. Pushing your social media audience further down the sales funnel, due to strong click through rates on your posts. Providing you with a clearer picture of which marketing tactics are working well and what should be tweaked. Obtaining insight into your audience, including what they like hearing and learning from you and what they don’t. Connecting your business with your audience, on a deeper level, by enabling you to engage back. Before you can effectively boost social media engagement, you need to have a sound social media engagement strategy. This will pave the way for your content, empower you to track successes and remind you to engage back with your audience. Keeping tabs on current trends and holidays, in addition to any upcoming events, launches or campaigns. Think about the unique posts you’ll develop to promote these. Engaging with any comments, questions and feedback you receive on social media, by responding with a personalized comment. Tracking the performance of posts, each month, and expanding on what’s performing well. A simple way to get started is to analyze what posts have performed well—in terms of likes, comments and shares—in the past few months. Try to repurpose these posts and see if they do just as well the second time around. If so, you’ll know that you’ve found a good topic, post type and copy that you can replicate in other posts. Status posts that comprise a question. Links to a recent blog post, with an interesting statistic or fact caption. Branded image that highlights a client testimonial. Quick video, featuring some tips. It’s also important to test those various types of posts, to see what resonates and engages your audience. When you figure that out, do more of it! Incorporating trending topics or holidays—even “social media” holidays like #NationalDonutDay—which are applicable to your business, can help increase social media engagement. People love seeing relatable, lighthearted posts. As such, be sure to include a few, fun, holiday posts in your social media engagement strategy. Come across an interesting article topic, that corresponds to your business’s industry lately? If so, make use of that content on your brand’s social media channels and tag the writer, to let them know what you learned from their article, to help with social media engagement. This will assist in establishing you as an industry leader, with your audience. An added benefit is that there’s a good chance the writer will comment and/or share your post, for extra exposure and promotion. At CMA, we believe that social media engagement goes both ways. We love seeing engagement on our client’s social media channels, but we know it’s just as important to reciprocate and make sure our client’s audience stays engaged. When you get engagement, give engagement! If a customer leaves a positive comment, respond back by addressing them directly and thanking them for the feedback. You also can ask a question in return. This will help solidify the trust they already have in your brand. BuzzSumo – Shows you what topics are trending with your audience and enables you to analyze what content performs best for any topic or competitor. Canva and AdobeSpark – Allows you to create eye-catching images and videos, to push out on social media. Sprout Social or Hootsuite – Tools that can help your business monitor social media engagement, in addition to planning and scheduling posts. Facebook, Twitter, LinkedIn, Instagram, Pinterest and other social media channels – Offer analytics and insights tools. Spend some time each month looking at which posts gained the best social media engagement and what posts didn’t. Then, readjust your strategy based on those findings. It’s always interesting to track social media engagement metrics, month-over-month, to help notice trends. In addition to just looking at the number of engagements, impressions and clicks, businesses also can track average engagement rate, to see the number of engagements on posts in relation to number of followers. Adding up all likes, comments and shares a post receives. Dividing that by your total number of followers. Multiplying by 100, to get your average engagement rate percentage. Facebook Insights can help you understand who among your audience is most engaged with your page and provides helpful information about the days of the week and times, when most of your followers are online. Also, the types of posts that receive the highest engagement. Utilize this information to tailor your future content! Does your business have an event or launch coming up, that you’d like to build hype around? If so, ask your loyal customers to share it on social media. 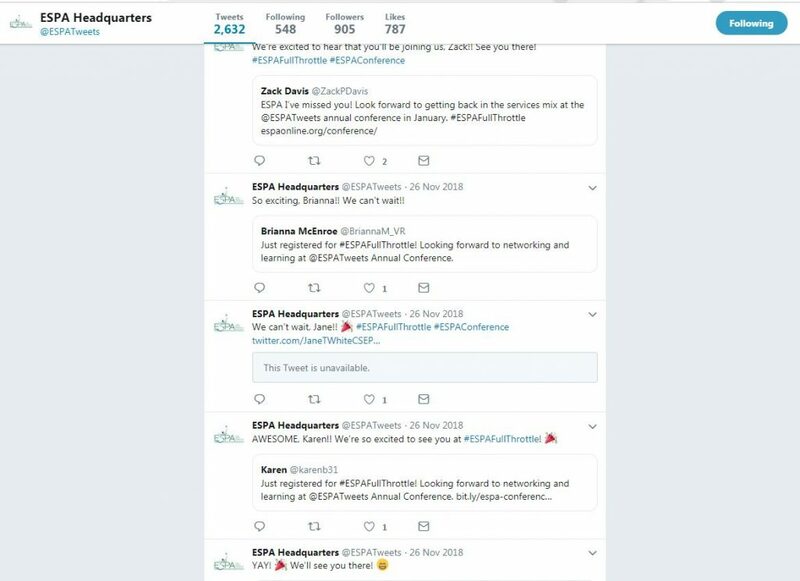 CMA tested this method for one of its clients, Event Service Professionals Association (ESPA), by distributing an e-blast to association members to let them know that we’re excited to build awareness around an upcoming event and provided them with copy to post on their social media channels. Within minutes of the e-blast going out, we began seeing members Tweeting about what they were looking forward to most. CMA responded to every comment, on ESPA’s behalf, with personalized messages to build on that excitement. The event, which was once just being seen by ESPA’s audience, now had eyes on it from the followers of each member who shared the message. As those results show, adding influencer marketing to the mix can work wonders for engagement! In a recent posting, Martech included an infographic from Branex, 11 Social Media Engagement Boosting Tactics That Actually Work, which stated that 95 percent of marketers believe that influencer marketing strategy is effective. Social media influencers possess a greater ability to provide brands with an increased reach and can give your social media marketing campaign a boost. Social media engagement, like marketing in general, is all about testing out new ideas and seeing what produces the best results. Don’t be afraid to try different, unique ideas in your social media posts. It might end up being your most popular post of the year! Do you want to boost social media engagement, with your target audience? Contact us today, to get the conversation started. Kelly Potts is a social media specialist at CMA, a full-service communications, marketing and association management firm, which has provided its clients with award-winning and proven results for more than 30 years.